Why? Well does everyone know how to install a basic printer? But there is the printer manual on how to install one. Every new printer that is bought off the shelf comes with one manual. Yes that true but does everyone really read those manual or do take time to understand them. To most of user installing a printer on their own is simply hard to do. If something's go wrong during the installation process they easily give up and ask a tech supp guy to do it for them with payment of course. Most printers' installation is the same and they use the same cable connection with the computer Universal Serial Bus cable. Let's do a quick checklist on what we need to install a newly bought regular printer. The printer itself, CD driver, USB cable and the power cable. All of them must be present to be able to install the printer on to the computer. Most common mistake by people installing their printer is plugging the printer first to the computer then waiting for it to install itself. This will only work if your computer's operating system is regularly updated on all its driver and software front. Also even if you successfully installed the driver of today printer most of its monitoring software will not be included. This monitoring software is also important in the day to day operation of the printer. When you're going to check for the ink level of your printer this additional software. Another function of this software it the maintenance side of it. Which we will not go into details here. To get started first put the CD or DVD driver into your CD/DVD ROM drive and let the auto play or if the auto play ask to allow it to run then go ahead and click the okay button. Then after clicking the button wait for it to display the welcome screen or the menu asking you to choose what kinds of installation would you like. Now to make this simple if you see an option to install all items then go ahead and check the box beside it or check all the box besides all the item listed including the driver. This make take a little longer to install but at least will you can be sure that all features of your printer are taken care of. Now click the next button to continue. Wait for the installation program to ask for you to connect your printer. 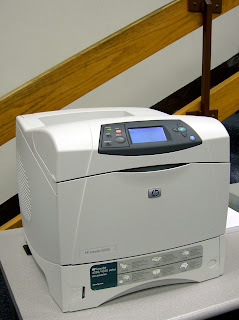 When the program ask you to connect your printer make sure that you connect the printer properly on the USB port of your computer and turn it on and wait for the program to detect your printer and to continue installing it and the rest of the software package that goes with it. Remember to wait for it finishes the installation routine. A screen will display that the installation is done and you will know it. There are some nice tips, through which we can take help. Thanks for this tips. I enjoyed your posts. Helps me understand about the computer more. I hope you had chance to check this article about traffic rank = as you've asked on my blog. Thanks for the walkthrough It's really useful.